Want to enhance the eye shape? Looking for a technique for a classic lift? Then, check out these simple eye makeup tips to combat droopy eyes! The classic lift eye is a simple technique that is used to enhance the eye shape and give it a slightly lifted effect to combat droopiness. Whether you have light or dark eyes, this is one makeup trick that you can’t go wrong with. Choose the shades that suit your eye color best and with just a few strokes of the makeup brush your beautiful almond shaped eyes will be the envy of everyone you meet. 1. Highlight: Start by applying highlighter to give a proper definition to your eyes. If you don’t have a highlighter, you can even opt for a white eyeliner pencil for the desired effect. Before you begin, remember the four-point rule – above the brow, below the brow, centre eyelid, inner eyelid. 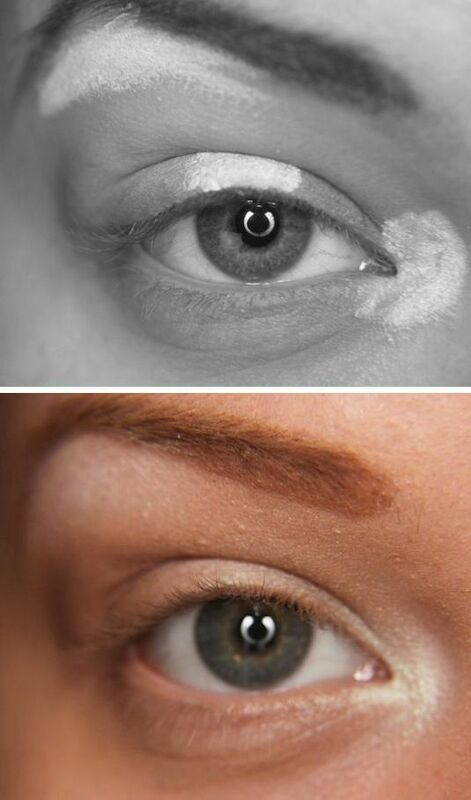 Spread the white liner in these four places and smudge it with your finger to blend it in and enhance the area. 2. Give it a base: After the highlighting, spread a light eyeshadow shade on your entire lid. Opt for a light neutral shade for the day and a slightly more shimmer based shade for the night. 3. Add the lift: Now to add the lift and definition to the eyes, draw a thin stroke along the lash line with a dark shade of eyeliner pencil. Draw a line which is narrow at the inner corner and thicker at the outer end. Give it a slight upward flick towards the end. Opt for shades like black, dark brown or navy. Next take the same shade in an eyeshadow and using a narrow brush, blend it over the eyeliner in outward and upward strokes towards the temples. 4. Crease it up: Using the same dark shade, apply it from the outer corner of the eye along the crease line. Make sure to apply it only to about two-thirds of the crease, just a little more than the center of the eyelid. Blend it in along the eyeliner to the outer eyelid and along the crease in a smooth motion. 5. Finishing touches: Finally, take a medium shade and apply it along the curve of the darker shade on the outer corner of your eyelid between the light and dark shade. Using a blending brush, smudge the shadow till it blends seamlessly. Finally add a dash of mascara. Add a second coat only on the lashes towards the outer corner to give it more of a lifted appearance. Voila, with these 5 simple tips, you will master the classic lift eye in no time!